This lighter weight version of the 4 Rider has sporty multi-spoke wheels and durable rubber tires that make for a lighter total package, front swivel wheels lock with a single easy action. This model has an intelligent click mechanism that enables you to tranform it from a pram into a stroller or to fit a car seat (with adaptor) with a simple, easy movement. It has a unique and easy to engage folding mechanism that is easy to employ with either the cot or seat attached, and large storage basket is always easy to access. The singel-hand adjustable handle bars give a wide range of heights for the comfort of all who push it and is sturdy even at the highest position. Front swivel wheels lock with a single action, a large foot break at the rear is ergonomically designed to be easy to engage for added safety. Quick release wheels have enclosed ball bearings for all-terrain travel. 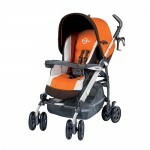 Stroller Seat and Carrycot sold seperately.